Over the past year or so, Trader Joe's has been releasing a steady stream of sriracha products, starting, of course, with Sriracha Sauce. We've also seen Sriracha Ranch Dressing, Sriracha Garlic BBQ Sauce, and even Sriracha Bacon. On parallel, yet completely unrelated lines, TJ's has offered us a line of fancy potato chip flavors, including Turkey and Stuffing, Ghost Pepper, and South African Style Seasoning varieties. 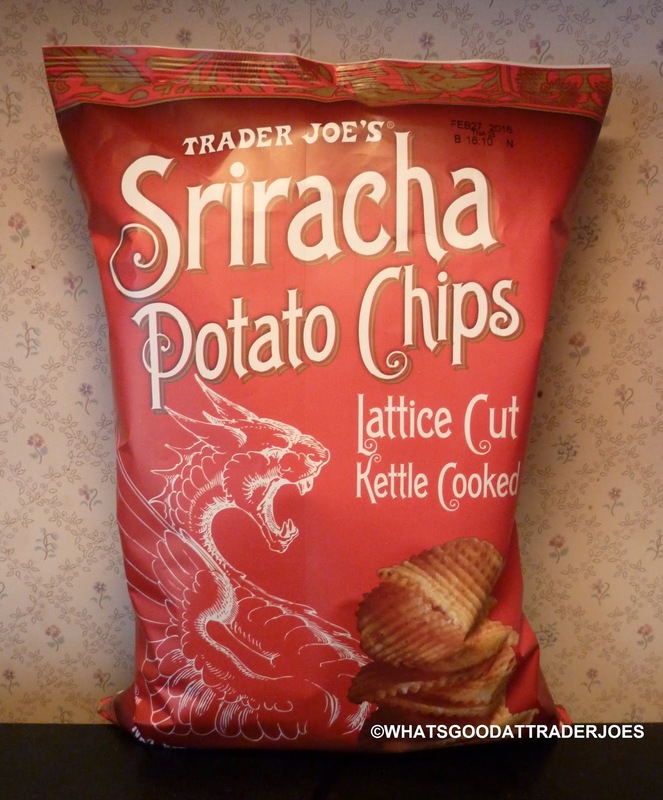 I guess it's inevitable that the two would eventually meet, join forces, and yield the sweet love child of sriracha and potato in the form of these delicious, spicy chips. The bold red packaging features a familiar, menacing dragon that some TJ's fans think resembles a cat. Sure, I can see where they're coming from. If the lion is the king of the jungle and the housecat is the king of the internet, then perhaps Trader Joe's just latched on to those concepts of royalty in an attempt to create the "king of the cupboard." And they put forth a brilliant effort in this foodie-hack's humble opinion. The attack is salty and sweet, and a moment later, a big, fearless wave of tangy sriracha flavor bowls your tongue right off its feet. I mean, tongues don't have feet...but if they did, boy. The spice level is nice and strong, as someone who likes a little heat. As mentioned in a recent podcast episode, the only weakness I, personally, saw with the Turkey and Stuffing chips (reviewed here by my courageous culinary compatriot, Russ) was that they were flat, kettle-style chips rather than firm, ridged or lattice-style chips. The potato chip gods heard my cries and graciously lavished me with some super-crunchtastic, ridgey, lattice-cut chips. I think the texture of these chips is just about perfect. 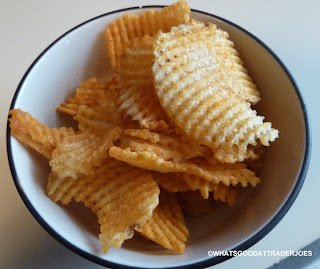 Not too long ago, I reviewed some other very decent sriracha potato chips. 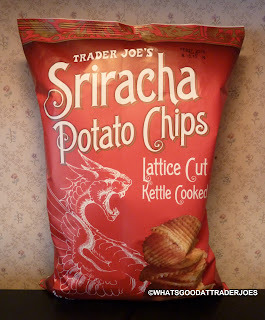 But as good as they were, these Trader Joe's chips are most definitely superior. The first chip or two out of the bag doesn't blast your tongue with pain, but after snacking for a while, the spiciness builds up and—while not anywhere close to the realm of "I'm in pain, I can't eat anymore!" —one might find him or herself craving a glass of water or milk. People with particular sensitivity to spicy foods may want to steer clear completely. I can't compare these to the Ghost Pepper chips because, once again, Russ beat me to the review, and they're currently not available at any of our local TJ's. (Nor are the Turkey and Stuffing chips, FYI.) My friendly Trader Joe's checkout clerk today said that every month or two, a new chip flavor would appear on TJ's shelves—and she didn't come right out and say it, but she implied that an old flavor would disappear just as frequently. Well, Big Joe, my vote is that these particular chips stay. Year round. Please. They're not Thanksgivingy or Christmassy at all...so maybe keep them around just to see how they do in other seasons, hmm? Sonia wasn't as impressed as I was. Her comments: "They remind me of Chinese food, but they're not spicy." Three and a half stars from her. Four and a half stars from me.